In her dream, Saya was always six years old. Long fingers of flame rose up against the darkness, lighting the sky above. Fire blazed spiteful and triumphant above what she had once thought most secure–her home, that safe, warm refuge that she was so sure would always be there. The glowing hearth; the single room in which her family lived permeated with the smells of cooking and familiar people; her own wooden bowl; her mother’s soft, plump lap covered in rough-woven cloth–all were consumed by the flames. The child Saya had somehow managed to find her way to the marsh at the edge of the village, but with no one there to lead her by the hand, she could go no farther. Crouched in a clump of dying reeds, she trembled with terror, choking down the hard lump of fear in her throat, unable even to cry. 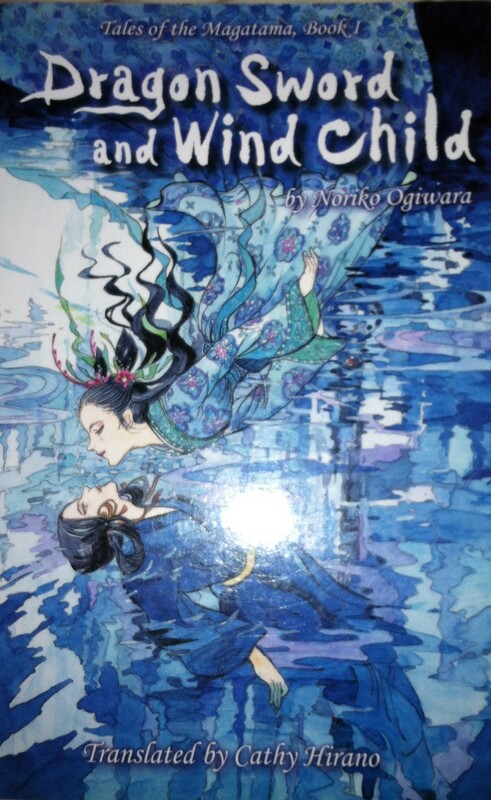 I’m not sure how old I was when I first read Dragon Sword and Wind Child by Noriko Ogiwara. I know it was before I started keeping my reading record at age 13, because the first time this book appears on the record is in 2004 when I re-read it while staying with my parents, at age 22. While I don’t know how old I was when I first read it, I do know that I discovered this book at the Cobb County Public Library, at what is now the main branch, what was at the time the massive new building that replaced my beloved little library in the town square where the children’s books were housed in an attic alcove you had to climb several staircases to get to. Judging by the comments on Goodreads and also on Tales of Magatama, a fan blog, my experience with Dragon Sword and Wind Child is not unique. Many of the comments reference chancing upon the book at the library as a child, as I did. The original cover is striking and I imagine that it’s what first drew my attention, all those years ago. Translated into English by Cathy Hirano, the book is a retelling of a Japanese creation myth, a story that centers around fifteen year old Saya. While it contains a lot of the familiar tropes and imagery common to mythic tales, it was a mythology completely foreign to me. Though it’s told in the relatively flat tone also common to mythology, it resonated personally with me. The familiar comforted me and the foreign thrilled me. A lot of it would’ve sailed over my head on my first reading, but I always remembered it as a favorite book. For many years, copies of the English translation were almost impossible to find, selling for over $100 online. When I wanted to re-read it ten years ago, I discovered that the Cobb County library still had the same copy I read as a child. In 2007, it was released in a new paperback edition with new cover art. While I think the new cover is beautiful, it doesn’t really strike me as relevant to the story as the original. The book never felt open-ended to me, so I was surprised to learn that it was the first in a trilogy, Tales of the Magatama or The Jade Trilogy. The English version of the second book was released in 2011 as Mirror Sword and Shadow Prince, but I haven’t read it yet. I’m curious, but reluctant, too. So far, the third book hasn’t been published in English and I think this is part of what makes me hesitate to read the second book. By chance, I was visiting my parents at the beginning of February, when I planned to re-read Dragon Sword and Wind Child, so even though I own a copy of the reprint, I decided to check out the original from the Cobb County library and compare them side by side. Unfortunately, I learned that the book had been officially discarded from the library system. Because I’ve been volunteering with my local library, dealing with discards for the book sales, I can understand why this happened, why it was probably necessary, and yet I have to say I was emotional about it regardless. It probably happened shortly after the 2007 reprint. The original hardcover was no longer as valuable and probably had suffered a significant amount of wear over the years. Probably the new cover appeals to today’s children and teenagers more because it looks very manga-like. Unable to compare the two copies, I dove into my copy of the reprint, which nicely contains an Afterward written by Ogiwara in 2005. It was a weird experience, something like recovering memories after amnesia, I imagine. As I read, I would remember characters and elements of the story right as or right before they were revealed. As an adult, I felt impatience with Saya that I probably didn’t feel as a child. She’s very passive, in fact it’s an integral part of her character: it’s her job to “still” the dragon sword. She’s surrounded by people who know more about the eternal battle between the Light and the Darkness than she does and she constantly looks to them for answers and protection. I had to remind myself that this is true of most children—they have less information than the others around them, they look to others for guidance and they have to make mistakes in order to learn. One thing that I very much enjoyed about the story, and I’m sure this drew me as a child too, is that the standard Western tropes are often reversed. If there is a “bad guy,” it’s the side of Light, not Darkness (though the Western standard of male = sun and female = moon analogy is present here). Princess Teruhi is the more fierce of the two twin children of the God of Light. Her brother, Prince Tsukishiro, is the more conciliatory of them. There is a hint of the maiden-mother-crone triumvirate at work in the story and (SPOILER!) they all die. Someone with an expertise in Japanese mythology and literature, as well as world mythology, could probably write a book about Dragon Sword and Wind Child’s place within Japanese literature and the larger mythological canon. I’d love for there to be an annotated edition of the trilogy for Western readers one day – that would be simply incredible. 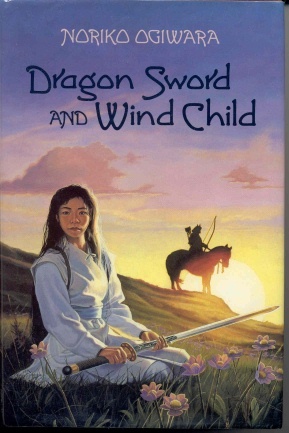 In the meantime, what I know is that Dragon Sword and Wind Child, being the complex and beautiful book that it is, finding me when it did, helped influence my love of fantasy and myth. It’s a big reason why I love books that unite fantasy and mythology, books like George R.R. Martin’s Song of Ice and Fire series, The Neverending Story, Kai Meyer’s books, Ronlyn Domingue’s Keeper of Tales trilogy and at least one book I’ll re-read later this year. Dragon Sword and Wind Child remains a beloved book from my childhood.